When I met my (future) husband’s grandma, she was 89 years old. She was getting ready to go on a helicopter ride. One helicopter ride later, she said it was fun but… it had messed up her hair. Cue her trademark grin and chuckle. Ms. Gambling Granny (GG) politely told me it was nice to meet me and hinted around that she’d be glad for a ride to the casino if anyone was heading in that direction. And I fell in love with her grandson, but not before falling in love with her first! 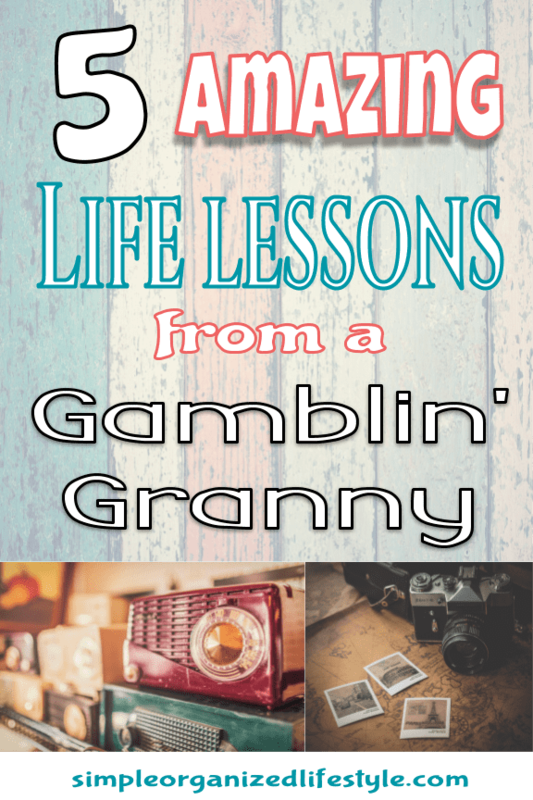 I got three more years to be in this special lady’s life and it wasn’t enough, but I am going to cling to these 5 amazing life lessons learned from one extra special gamblin grandma. It’s my hope that they are carried on with the generations she left behind. 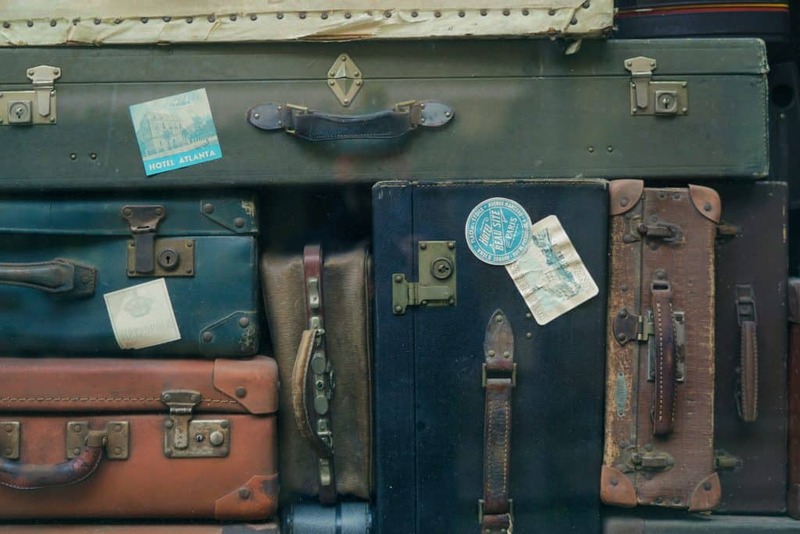 These lessons will make for a life lived more abundantly, but don’t take my word for it, take it from a gambling grandma who never lost a game of Chinese Checkers. Ms. GG loved to fish. She loved to sit on her back porch. She had dogs and cats over the years that mostly found her instead of the other way around. Ms. GG enjoyed bird feeders and flowers. She would stay up late to watch a family of raccoons from her kitchen window or get up early to see the sunrise. She lived loudly, but enjoyed the quiet- sweet- moments of life. 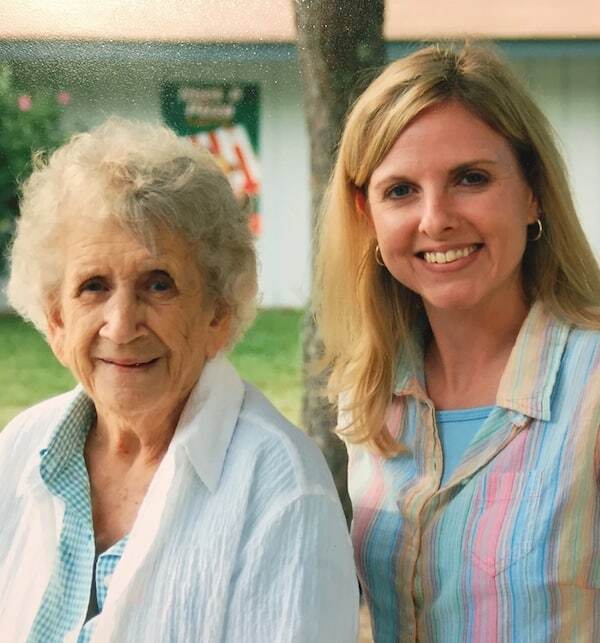 I don’t think for one minute that Ms. GG’s final years were spent dwelling on any regrets or the “what if’s.” Instead, I think she held on to every small moment, which in turn, created a life well lived. When I sit on the porch swing with my family in the evening, or have a cup of coffee on a leisure rainy morning, I try to pause and just take in the moment. It’s hard not to get caught up in the busyness or day to day grind but those sweet small moments are what really creates a big life. So, Ms. GG had homemade recipes for all kinds of ailments. And one of those was her homemade honey cough syrup. Instead of putting a little disclaimer on the bottle about one of the key ingredients being moonshine, she would just tell you a true story. Ms. GG’s daughter [Dee] moved to the big city for a new job. One of her new co-workers [Ms. A.] had a nagging cough that wouldn’t go away. Dee told Ms. A about her mom’s homemade cough syrup and asked if she wanted to give it a try. Dee passed along the syrup with instructions to take a tablespoon. Ms. A does not show up for work and no one can reach her. Police are contacted and enter her home when no one comes to the door. Turns out, Ms. A thought the cough syrup was really tasty and didn’t hear (or conveniently forgot) about the tablespoon part. She was passed out cold. Thankfully, there was no major harm… and no more nagging cough! Things like that can’t be made up and neither was the special recipe. As luck would have it, I compiled a bunch of GG’s favorite recipes into a keepsake book and guess what turned up? And a few clicks later and according to some Amazon reviews, it’s the perfect lemon drop! Lol, still learning from this sweet lady! There are generations before us who figured out how to do things a little differently… they had to be scrappy! In the three years that I knew Ms. GG, she killed a rattlesnake with a shovel, yelled at a black bear on her porch and snuck around to get pictures of raccoons that were eating her cat’s food. This was in her early 90’s. I can only imagine what I don’t know about the first 89 years! In the fight or flight mode when it comes to rattlesnakes and bears, I’m not sure what I would do but I lean more towards flight! However, there is much to be said, and learned, from someone who decides to meet their fears head on. Aside from random encounters with wild life, it reminds me that to not take any risks in life is to not get to experience any rewards. I’ve taken on some risks lately and I know if Ms. GG were here, she would be in the front row cheering me on! Maybe it’s a fear of failure, or fear of the unknown, but the only way to find out what possibilities are waiting around the corner is to meet the fear head on! I’ve already mentioned that Ms. GG never lost a game of Chinese Checkers. She also played Deal or no Deal with the best of them. She finished every jumble puzzle and didn’t let much stand in the way of keeping up with her favorite ball teams. She read. She enjoyed taking pictures. She played cards (and there may or may not have been some trash talkin’ involved). And skipped the quarter machines and went straight to the $1 ones. She enjoyed travel and taking the scenic route. In essence, she found ways to constantly feed her mind and her mind kept growing as result. I believe keeping our minds engaged with new and interesting ideas is a great way to ultimately feed our souls. These would be three of my all time favorite stories that never failed to bring the infamous chuckle from Ms. GG. The time she made a gag cake out of a sponge for her boss (a very “all business” man who had a sweet tooth). He tried to cut it and the knife bounced back… and he let out a few swear words. She told this story so well it’s like we were all there with her! When her health started to decline, Ms. GG had some in-home nursing care who quickly became attached to her, and one of them was getting married. Ms. GG bought her a wedding gift… and it was some of the slinkiest lingerie she could find. She delighted in catching someone off guard in the name of pure fun. In those final moments, she knew. And even then, she told the doctors that “she didn’t come into the world with her false teeth, and she wasn’t going out with them.” Her health may have been compromised, but never her wit. I am way too far on the serious and overly cautious side, have always been that way. But I recognize the power and potential of the homemade medicine called laughter. We could probably all use more of it. Life is too short not to laugh more. Now, let me shift just a minute and tell you a few things about my young son. She would have gotten a kick out of his personality, especially since his dad and I are quiet and reserved and he is complete opposite. She would have loved his sense of humor and his trademark grin and chuckle. She would have seen a lot of herself. there’s not anyone else’s footsteps I’d rather him follow than a gamblin granny who knew how to win at life. I enjoyed reading about Ms. GG. Grandparents are simply the best. Some of her stories remind me of my grandparents, that I was lucky enough to have around until they were 96 & 95. I’m also very grateful for the time my son got to spend with them. 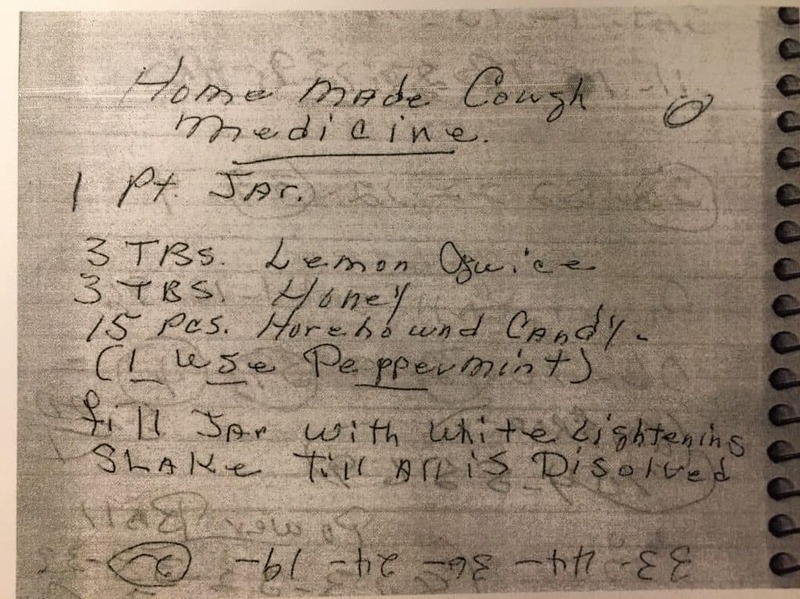 That cough syrup recipe is priceless! Grandparents are the best and I’m just so glad I had time, even if it was short, to spend with her. The cough syrup… make/take at your own risk, lol. Thanks for commenting Leslie!